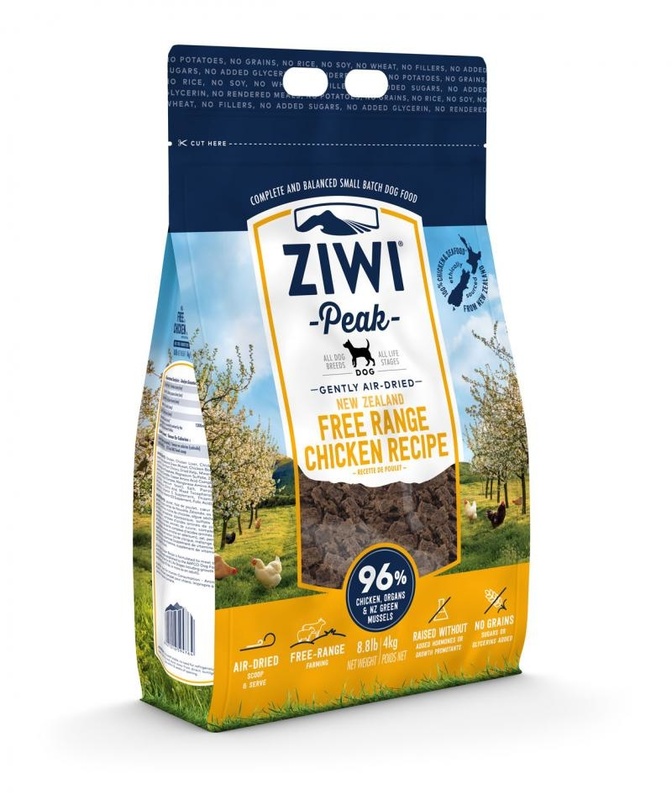 Home » Ziwipeak-Air Dried Dog Food "Chicken"
Ziwipeak-Air Dried Dog Food "Chicken"
Gently air-dried free-range New Zealand chicken for dogs of all breeds and life stages. Try our new free-range chicken recipe, made from 100% New Zealand free-range chicken, organs and green-lipped mussel. All farms are independently audited and certified as humane and free range, and our chickens are ethically raised without added hormones or growth promotants, resulting in both a nutritious and highly palatable pet food for your dog. 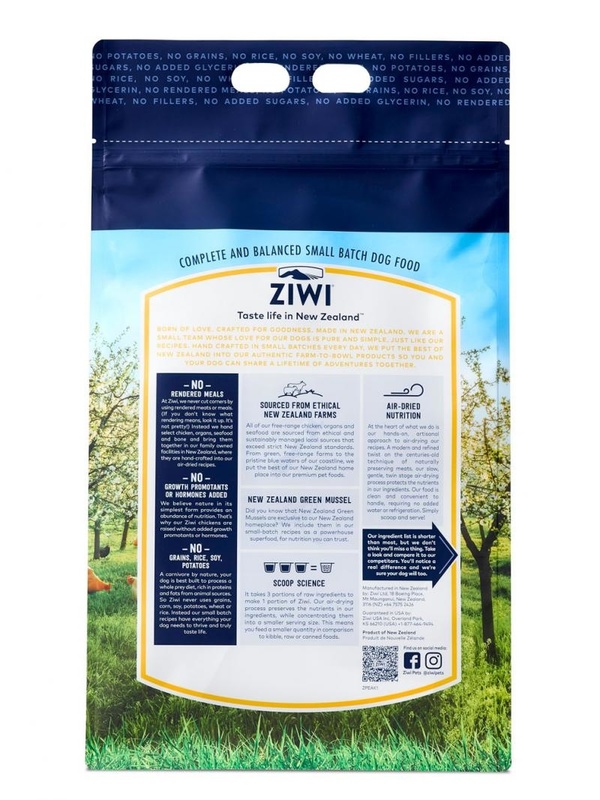 Our air-dried recipes include ingredients that are naturally binding when blended; Ziwi does not use glycerin, yield enhancers, artificial gelling agents, fillers, or sweeteners in our recipes. Chicken is the number one protein fed globally to dogs. Our recipe contains over 96% meat, organs, bone, and green lipped mussels all sourced from accredited New Zealand free-range farms, fully balanced with all the necessary vitamins and minerals. Limited Ingredient Diet – High meat content recipe with added essential vitamins and minerals for a complete and balanced diet. Gentle air-drying process: naturally preserves the nutritional value of 96% Meat, Organs, Bone and New Zealand Green Mussel that go into making Ziwi Peak Air-Dried dog food. We use only 100% New Zealand Free Range Chicken meat and organs. All chickens are raised without added hormones, chemicals or growth promotants. The free-range chicken used in our recipe provides an excellent source of protein. Our free-range chickens are never force-fed or raised in barns, and all chickens can forage freely outside at will, resulting in higher quality and better tasting meat. All of our free-range chicken farms are independently audited and certified as humane and free range. Includes 3% New Zealand green-lipped mussel, a great natural source of glucosamine and chondroitin. Chicken is a great choice for dogs who are sensitive to red meats. More nutrition due to the air drying process: It minimises any damage to the proteins, vitamins, and sensitive nutrients in the all-natural ingredients, so that your dog gets nearly all the benefits of a raw meat diet. Includes natural carbohydrates from natural sources such as chicory, kelp and parsley, plus essential vitamins and minerals for a balanced diet.